Killer Characters: Refresh, Restore, or Renovate? When you’re renovating a business and your home, because they’re one and the same, it is tough to know where to draw the line. A budget certainly helps, but more than that, what am I trying to do? Refresh, restore, or renovate? The Cog and Sprocket has been in my family for years. My great great grandfather built it, and the clock business, over a hundred years ago. He was a great clockmaker, according to family lore. That seems to skip generations. His son, Harry, wasn’t quite as talented, but he was a good businessman who got the shop through the Great Depression. He may have gotten Orchard through Prohibition creatively, but that’s a story for another day. My grandfather, Thomas, was Harry’s son. I called him G.T. for Grandpa Thom, since he didn’t like me calling him Grandpa in the shop, and when I was visiting I was in the shop all the time. G.T. was a great clockmaker. His son, my father, not only did not inherit the gene, he left the family business behind as soon as he could. I’d like to think I did inherit some of G.T.’s skill. He certainly encouraged me, sending me to school in London to hone it. When I took over the Cog & Sprocket, the upstairs apartment was being used for storage, and the downstairs hadn’t seen a coat of paint in years. I had six weeks and a small budget. Time and money were offset by lots of help. Lots of it. My friends Rick and Steve came up from Boston every weekend. Ben the handsome barber and Pat Reed used talents I don’t even think they knew they had. Caroline and Flo oversaw recovering all the furniture, even though I don’t think Caroline approved my fabric choices. I did keep Flo away from choosing paint colors. I can only imagine what she’d come up with! So, did we refresh, restore, or renovate the Cog & Sprocket? Yes. And I love it. What do you think? Clock and Dagger has some of the details! To celebrate the release of Clock and Dagger, Julianne Holmes will give one commenter, chosen at random, a signed copy of the book. A name will be picked August 29. Please put your email in your comment. Good luck! Julianne Holmes is on Facebook, Twitter, and Instagram. Occasionally she is also on Pinterest. She's trying to figure out Snapchat, but no luck so far. Maybe next month? This book is on my wish list. Thanks for the chance. I've been wishing for this book for weeks. On Social Security so I can't just buy anything I want. Sigh. I'd love to read this book. I also think I need to do a little refreshing and renovating here at my house. Thanks for the contest. I like the idea of calling her grandfather GT. Sweet. I think you restored and refreshed! Looking forward to reading the book, thanks for the chance to win! So excited to read this book. Love the name of the clock shop. I think the shop has been refreshed and restored. I have this book on my TBR list and I can't wait to read "Clock and Dagger". Thanks for the chance. I hope I win this new to this author!!! I very much would love to get this! I love the title and cover, and this sounds like a fun read. Thanks for the giveaway. Refresh, restore, or renovate the Cog & Sprocket? All 3! Loved Just Killing Time. 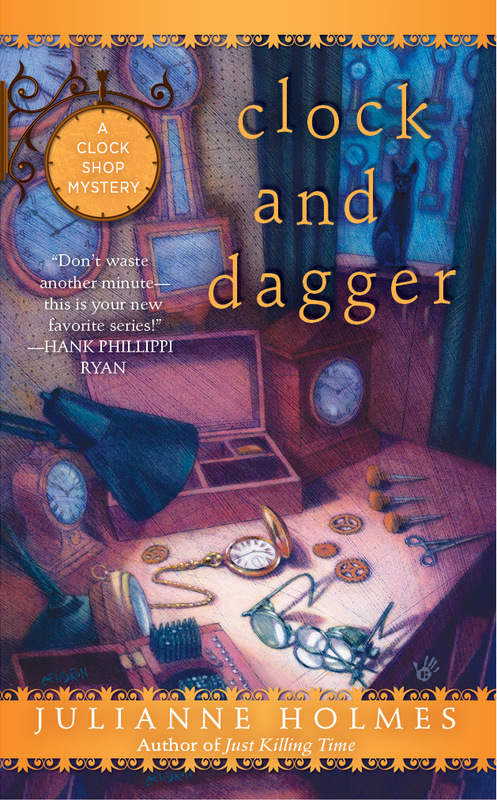 Clock and Dagger sounds like another terrific read. I think you did all three. This sounds like fun. I'd love to read it. My Great-grandfather had a jewelry store and clock business. So I know I would love reading this. Thank you for the Contest. Sounds like my kinda book. Thanks for the chance. I agree with Angela...I vote for restoration. It's right in the middle of the spectrum between spending too little and spending too much. And, preserving a beloved business is a grand gesture. Thank you for the chance to win your book...I love the cover! Maybe all three I say. I have always found clocks very interesting! The sereis looks great. Thnaks for the chance to win!